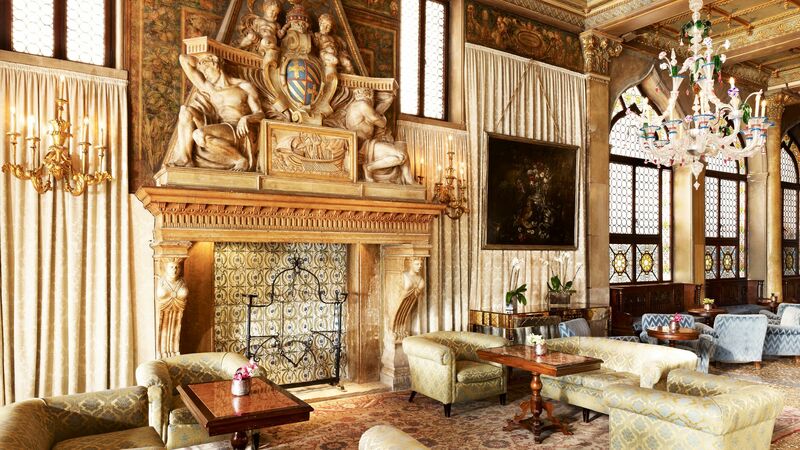 Hotel Danieli, a Luxury Collection Hotel, overlooks Venice’s lagoon and features fantastic historic features throughout. Its wonderful architecture is typical of Venice, with opulent Venetian décor and wonderful antiques inside. When it comes to dining there are two restaurants, each offering carefully curated menus featuring traditional Italian cuisine and Asian influences. Dishes are made using the freshest, locally sourced ingredients. In the evening, enjoy cocktails, fine wines and handcrafted beers as you overlook the grand canal from the hotel’s rooftop terrace by candlelight. Couples and explorers will love this hotel, with its easy access to Venice’s iconic waterways and St Mark’s Square, as well as Lido Island. This is the ideal hotel for a romantic stay in one of the world’s most unique cities. Hotel child prices apply to ages 2-11 years. 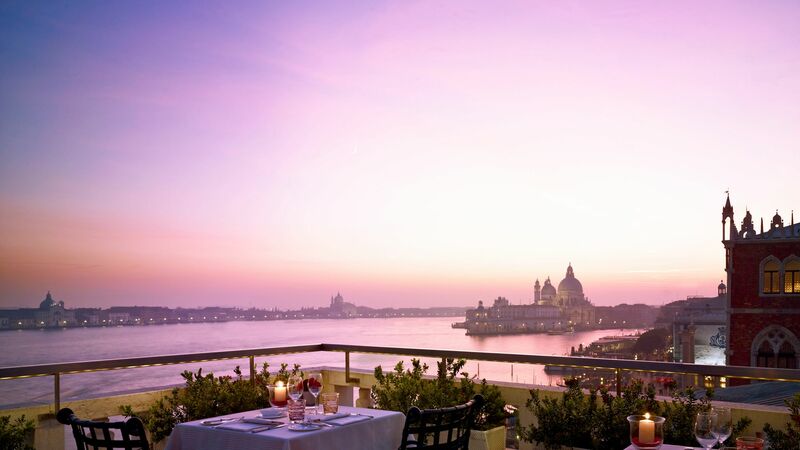 Enjoy delicious flavours and traditional Venetian dishes on this elegant terrace, overlooking Venice’s central canal. The menu features Asian and Italian dishes made using fresh, locally sourced ingredients. Serving the best of Italian dishes from several different regions, enjoy the combination of simple traditional favourites and fine dining. Wash this down with fine Italian wines and handcrafted beers as you take in the spectacular views. Listen to live piano music in the evenings as you choose from classic cocktails and Italian specialities. 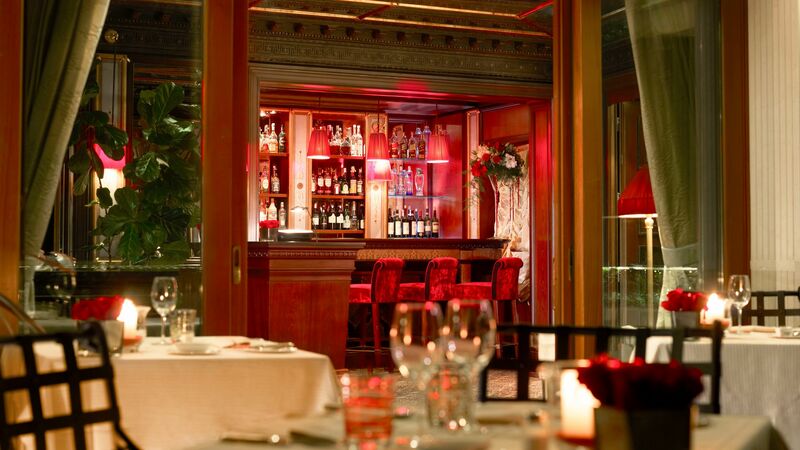 The elegant bar offers a beautiful traditional Italian setting, with marble columns and local artwork. Take in the views from this rooftop bar where you can choose from aperitifs and light bites, along with cocktails and fine wines. Keep active during your holidays at the Hotel Danieli’s fitness centre, which features cardio equipment and free weights. Hotel Danieli, a Luxury Collection Hotel, is located in the iconic city of Venice. Step outside the doors onto Palazzo Ducale and explore its stunning historic buildings, leading down to Piazza San Marco. Here you’ll find the spectacular basilica, boutique and designer shops and wonderful restaurants. Wander over the Bridge of Sighs and take in Venice’s intricate canals and lagoons, or visit Lido island for a relaxing day trip. It’s home to a golden sandy beach, as well as a golf course and some excellent eateries. If you want to explore the city’s culture further, attend an opera or ballet, or watch traditional glass blowers in their studio. Hotel Danieli, a Luxury Collection Hotel, is 30 minutes from Venice Marco Polo Airport by car and boat. These beautifully decorated rooms feature a king or twin size beds, air conditioning, a mini fridge, and large windows. The marble en suite bathroom has a shower and bath combination, makeup mirror, hairdryer, double sinks and more. Decorated in traditional, lavish Venetian style, these rooms feature large windows with bright interiors and opulent décor. Choose from a king size or twin beds, and enjoy the air conditioning, a mini fridge, desk and more. The marble en suite bathroom has a combined bath and shower, makeup mirror, hairdryer and double sinks. These spacious and opulent rooms offer lavishly decorated interiors with large windows. Choose from a king size bed or twin beds and enjoy the air conditioning, mini fridge and desk. There is also a marble en suite bathroom with a bath and shower combination, makeup mirror, hairdryer, double sinks and more. These opulently decorated rooms have beautiful interiors, large windows and everything you need for a relaxing stay. Choose from a king size or twin beds and enjoy the air conditioning, mini fridge, and desk. The marble en suite bathroom contains a shower and bath combination, make up mirror, hairdryer and double sinks. Take in spectacular views of Venice from the large windows in these beautifully decorated rooms. The rooms offer a choice of king size or twin beds, as well as having air conditioning, a mini fridge and desk. There is also a marble en suite bathroom with a combination bath and shower, makeup mirror, hairdryer and more. These lavish rooms feature beautiful Italian furniture and lavish furnishings, with large windows and a balcony offering stunning views of Venice’s canals. Choose from a king size or twin beds and enjoy the air conditioning, mini fridge and desk. There is also a marble en suite bathroom with a combination bath and shower, hairdryer, makeup mirror and more. Decorated in traditional, opulent Venetian style, these spacious suites feature a main bedroom and living room with beautiful Italian furniture. There is a choice of a king size or twin beds, as well as air conditioning, a mini fridge and a desk. The marble en suite bathroom offers a bath and shower combination, hairdryer and makeup mirror. Decorated in stunning pastels and featuring large windows overlooking some of Venice’s most beautiful sights, these suites offer comfortable amenities and facilities. Choose from a king size or twin beds and enjoy the seating area, desk, mini fridge and air conditioning. There is also a marble en suite bathroom with a combination bath and shower, hairdryer, makeup mirror and double sinks. These large, spacious suites have everything you need for a relaxing stay. The décor features traditional Italian details and beautiful furniture, and there is a choice of king size or twin beds. The separate bedroom and living room offer a seating area, mini bar, desk and air conditioning. There is also an en suite bathroom which has a bath and shower combination, marble décor, a hairdryer and more. These lavishly decorated rooms feature a separate bedroom and living room area, with traditional Italian décor and spectacular views of Venice. Choose from king size or twin beds and enjoy the mini bar, desk and air conditioning. There is also a marble en suite bathroom with a shower and bath combination, hairdryer, makeup mirror and more. The location of this hotel can't be beat: right on the Grand Canal, short walk to St. Mark's Plaza. The view from the top (where breakfast is served) is breathtaking. The interior is reminiscent of a family palazzo in the public spaces (indeed, I believe the original "core" was such a home. We stayed here as part of a college alumni trip, so could compare rooms. The room we had was spacious. Wifi was speedy. Service was gracious and attentive. We did not eat in the hotel restaurant, but the bar/light meals area on the ground floor was pricey, although had good service & offerings. The breakfast was excellent (as were all the breakfast buffets we had in Italy). One big drawback, and it was a biggie: we were warned not to leave windows open, but the hotel's room was stiflingly hot at night. Other people in our group had the same issue and were told that the hotel does not run A/C at this time of year (April). So my husband and I went ahead and opened the windows...and our overlooked a small canal...so we were eaten alive by mosquitos. What a choice: lose sleep because you're sweltering or get bitten by mosquitos. Not sure what happens in the summertime, but the weather outside was not super warm; no clue why the room temp was so uncomfortably warm at night. I had read previous reviews on the roiftop bar between 3 and 6 pm. We thought we would go and have a drink and take in the views. Lovely hotel but we really thought it was overpriced for drinks. A spritz aperol ?? ?22 each with pigeons diving on your table for food. This was an unrelaxing experience..... frequently agitated by them. Other people left due to this....once someone left table they where down eating leftovers.... i feel the hoyel coukd try better to conquer this problem amd make the expensive experience more relaxing. The service was good but it doesnt aim yo be a realxing time. “ We stepped into a dream....breathtaking! My husband and I were blown away by this hotel! It's even better than the pictures show. WOW! The location couldn't be better as you simply step off the water taxi from the Grand Canal and the hotel is right across the street. You are 3 min walk from San Marco square! The hotel has this old world charm feel to it. Loved the reception area (concierges were amazing and have GREAT recommendations for restaurants and activities) with the old tasseled keys hanging behind the desk. We figured it out after the second day that you can leave your keys with the reception and just ask for it every time you come and go. It's a nice touch to bring back the feel of how things used to be before the electronic card keys even though the tasseled keys they give you are actually electronic but they look like old keys. LOVE it! The entrance is jaw dropping beautiful. I've never seen a hotel with such beauty and history. If you are wanting that "dreamy" Italy experience, this hotel is an obvious choice. The service and amenities are 5* all the way. We were upgraded to a canal view room and we couldn't have been more pleased with our view and the set up of the room. We were expecting small quarters but the room is spacious and well appointed. The decor is old world charm with the padded floral walls. Bathroom is smaller an older style but was updated with current amenities, bathrobes, toiletries and fixtures. The main restaurant has one of the best patios with a view if you are lucky enough to sit out there during good weather it's breathtaking! Although the restaurant is very expensive we found the breakfasts to be amazing and the service is top notch. It's a true splurge to dine here! Our stay at this hotel surpassed my expectations of what Venice would "feel" like. It was truly like stepping into a dream. If you are looking for something special for your stay in Italy look no further. My stay was during a business trip and corporate event. Location - a 3 minutes walk from San MArco square is great. Hotel delivers outstanding service level, interior is jaw-dropping and full of historical heritage. View from roof restaurant is amazing. I wish to stay there once again. Upon walking in you are immediately blown away with the structure and design amongst the greeting literally as you step in the door. Friendly staff throughout the entire stay and in our opinion, worth every penny spent!